As I prepared to make my personal debut for Bourbon Street Shots, the all too familiar voodoo curse that comes in the form of injuries came for starting New Orleans Pelicans point guard Rajon Rondo’s soul. At this point, the injury bug practically feels like a mundane right-of-passage for anyone that joins the Pels’ roster. What ultimately feels like a punch in the gut for fans with Rondo’s news is that he was already making his presence known as a voical leader on the floor. New Orleans has not seen a commanding floor general since Chris Paul, the last franchise cornerstone, was shipped off to the Los Angeles Clippers. In the small sample size we were able to observe in preseason, we did see a version of Rondo was was in presumably good shape, an offensive rebounder and a distributor that could push the pace and prevent stretches of bad iso play. At this point, Pels fans may feel a little lost, again. With the diagnosis of no Rondo for at least 4-6 weeks, I had to put my editorial debut here on hold and throwout my game plan. However, after realigning my thoughts and watching preseason film, the Pelicans may not be throwing out theirs. 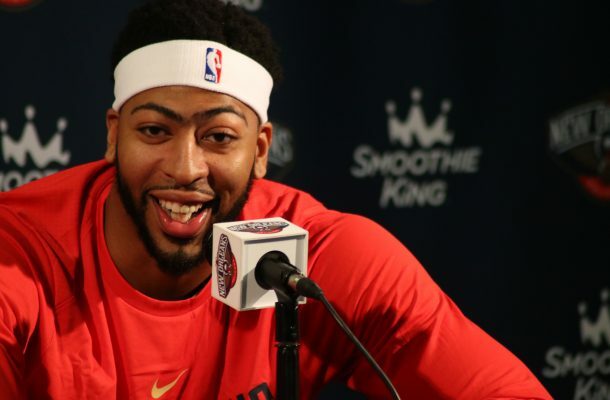 The returning players on the Pelicans’ roster, especially pre-Boogie, have been criticized as having passive personalities. I believe that’s fair. When you lose a player like Rondo you lose a coach on the floor and a playmaker. However, as the Pels were selling us on Rondo, his limitations were well analyzed. Before Rondo’s arrival basketball nerds celebrated the hiring of associate head coach Chris Finch to install the offense that turned Nikola Jokic into an elite offensive NBA center. We all fell in love with the idea of turning Demarcus Cousins to “Point-Boogie” in an offense where the Pels’ bigs initiated everything and were surrounded by shooters around the perimeter. We believed in becoming the inverted equation of the Golden State Warriors. Initially, we questioned how Rondo was the right man to run this offense. Though Rondo has never been known as a prolific shooter, we have been sold on the idea that his ability to push pace, rebound and cut will be an asset. This could be true considering Finch’s offense needs cutters. We also were reminded about defense, hence, the other pickup Tony Allen and re-siging of Dante Cunningham. What we need to remember is that no matter what kind of small-ball is happening in the NBA right now, the Pelicans are telling you that the pendulum is going to swing back in favor of bigs again. Their identity is invested in the two most evolved frontcourt players, possibly in the history of the game. Cousins also spoke confidently of what he hopes to accomplish with Davis. Staying true to the #DoItBig mantra, it may be safe to think of Rondo, a player on an one-year deal, more of a role player and the skills he brings to the table can be made up in other ways while the team waits for his return. I don’t actually expect Dell Demps to employ point guards off the street as he did two seasons ago in the absence of Jrue Holiday. I expect more of a point guard by committee situation sorted out by Alvin Gentry. I also believe they have settled with Holiday in an aggressive scoring role to start so I expect starts by Ian Clark and E’Twaun Moore and certain lineups where Holiday slides into the one spot. Let us not forget Holiday is part of the “Big 4” and became a $125 million man this summer for a reason. Gentry has repeatedly cited his versatility of playing both guard spots as to why his return was essential. Don’t forget we’ve often talked about the offense being initiated by bigs. If the Pels need more guard depth I would expect them to waive Jordan Crawford, but only for more depth on the wing than at point guard. With the NBA regular season starting about a week away, I believe the fate of the Pels is more in the hands of the bigs than their current guard situation.